Some forms of mariculture provide good quality food and the production is more efficient than that of terrestrial animals (roughly half the level of feed input per unit output is necessary) (CBD, 2004). Products obtained from mariculture are not only used directly as food items, but also as inputs for e.g. cosmetics, neutraceuticals, medicines, food additives and many more. But these problems can be mitigated to a huge extend. And it should not be forgotten, that in the long run mariculture itself is dependent on a good quality of its environment. Mariculture can play an important role, especially in rural areas for food security, economic and social welfare. In heavily populated coastal areas mariculture is in competition with other human activities for space and other resources. These other activities can for example be: fisheries, tourism, harbour operations, nature conservation and industry. Integrated Coastal Zone Management (ICZM) tries to bring these activities in the coastal zone together in a sustainable way. (Wu, 1995, Read and Fernandes, 2003, Wecker, 2006) In the different countries around the world legislation on mariculture and its enforcement vary widely, this is why they are not considered here. There are different possibilities to group the kinds of mariculture. The first one presented here is the subdivision by species. This is done because different species require different systems that have different characteristics and effects. Only the most common systems will be mentioned (CBD, 2004). Broodstock/seed supply: Bivalve mollusc larvae are either collected from natural grounds using material to which they adhere or produced in hatcheries by artificial fertilization. Growout: Larvae that have set to their substrate are grown in hanging cultures (suspended from floating rafts or long lines on strings, trays, stacks or mesh bags), vertical or rack culture (sticks or platforms), bottom culture (shells, stones, rocks or cement slabs added to the ground), or in land-based systems (CBD, 2004). Broodstock/seed supply: Until last decade the global industry relied on wild-caught larvae or berried (= egg-carrying) females. Nowadays there is a trend towards hatcheries. Growout: takes place in earthen ponds, concrete raceways and tanks (CBD, 2004). This includes macro- and microalgae as well as seagrasses. Broodstock/seed supply: Cultured aquatic plants have complicates life cycles with several intermediate stages. The major source of broodstock is wild collection. Most culture is now dependent on hatchery production of the early life stages (monospores, zoospores, gametophytes, sporophytes) which are attached to growing media and transferred to marine sites. Other propagation methods involve fragmentation. Growout: Young plants are cultured by 3 different methods: suspended (longline and raft), bottom cultures at the sea (large rocks or artificial shapes of concrete are placed on the seabed) and inland tank cultures (CBD, 2004). Broodstock/seed supply: The broodstock can be domesticated or a mix of domesticated and wild animals. Most species are grown from larvae or fry produced in hatcheries. There spawning is often induced with a hormone application. Growout: Cage culture can be divided into inshore and offshore cages and can be fixed, floating or submerged. Inshore cages are located in protected, shallow areas with less water circulation. Offshore cages are located in deep water and open areas with less protection from storm but with better water exchange. Nets and fish pen are located in shallow water and their edges are anchored to the bottom. A typical fish pond system consists of following basic components: pond compartments enclosed by dikes, canals for supply and drainage of water and gates or water control structures (CBD, 2004). Figure 4: Main differences between extensive, semi-intensive and intensive mariculture systems in terms of resource use and potential environmental risk (Tacon and Foster, 2003)). Enhancement or Sea Ranching is mostly developed with marine finfish. Both terms refer to the deliberate release of organisms from hatcheries into the natural ecosystem. In enhancement, fry are released to restock wild populations. In sea ranching, fish are harvested from artificially enclosed areas (CBD, 2004). It is also possible to co-culture different species: this will be further described in the section about mitigation. Their occurance and extend depend on husbandry parameters (species, culture method, feed type) and the nature of the receiving environment (physics, chemistry, biology). An additional factor that plays into the state of the receiving ecosystem is the release of waste products from other anthropogenic sources (e.g. effluents from industry or human settlements or agricultural runoff). Eutrophication defined as nutrient enrichment (mainly N and P) is considered by some the most important pollution threat to marine waters (Wu, 1999). This problem is often mentioned in the context of intensive culture of fish and shrimp, where a lot of artificial feed are used. There waste consisting of uneaten feed and faeces moves down into the benthos: below fish cages in areas with low currents waste sedimentation leads to a shift in benthic populations towards pollutant-resistant-species. But this effect is mostly confined to within a distance of 50-100m from the mariculture facilities. Another part of the waste products consisting of CO2, dissolved organic carbon and various soluble nutrients (e.g. ammonia and phosphate) move into the water column (CBD, 2004, Troell et al., 1999). Up to now a huge amount of anthropogenic input of nutrients (not only by mariculture) has caused major changes in structure and functioning of phyto-and zooplankton, benthic and fish communities (Wu, 1999, Troell et al., 1999). Areas with limited water exchange are at especially high risk. The effluents from fish farming have high N/P-ratios, which are considered a likely cause for the development of (non-) toxic algal blooms (Fig. 5). 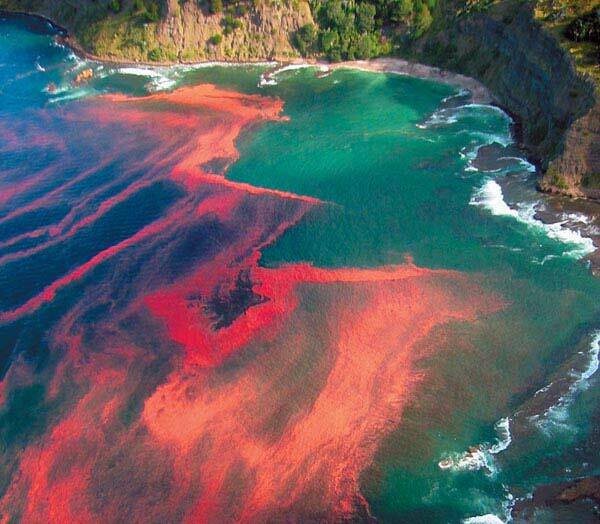 Algal blooms can shade seafloor vegetation and when they collapse their decay on the seafloor may lead to hypoxia or anoxia and hence mass mortality of benthos and fish (Troell et al., 2003). If the species of algae additionally produce toxic substances there is also a public health risk associated with them, mainly via human consumption of filter-feeding shellfish contaminated with the biotoxins (Wu, 1995). Pretty much the opposite of eutrophication may occur at intensive open ocean bivalve cultures: They take nutrients away from the marine foodweb. If this takes place excessively there is less left for other herbivores and phytoplankton and those that live off them. Apart from that bivalves take suspended particulate matter and change it into denser particles that fall to the bottom. This might have an effect on benthic communities as well (CBD, 2004). Table 2: Chemicals used in mariculture practice that can become pollutants, their sources/uses and impact (CBD, 2004). Due to crowded and stressful conditions in intensive mariculture there are frequently outbreaks of diseases. The pathogens can be moved to previously disease-free regions by transport of hatchery products like shrimp-postlarvae. And later animals with infections or parasites might escape and spread the pathogens to wild stocks (CBD, 2004). Alien species resulting from escaped culture stocks have established far from their home range. Some consider this just more biodiversity, while others think that they predate on or compete with native species and could eventually eliminate these (CBD, 2004). There is also concern that the escaped fish might lead to a decrease in intraspecific genetic variablility via mixing of escaped cultured animals with wild stocks. By this locally adaptive features of populations will interbreed with fish subject to artificial selection. Research fishing in the Faroese ocean area showed that 20-30% of salmon there are escapes from farms. (Read and Fernandes, 2003) In the future genetically modified fish might also become a problem (CBD, 2004). High value marine carnivorous finfish need animal sources of protein. Most of this comes from marine fish in the form of fish meal. The fish meal is made from small pelagic wild fish e.g. anchoveta and atlantic herring. This practise has two main disadvantages. One is that there is less left for marine predators like seals and seabirds and also commercially valuable predatory fish like cod (CBD, 2004). The other is concerning human food security. Often 2-5 times more fish protein is put into the farmed species than is supplied by the farmed product. In contrast herbivorous filter feeders contribute to food security (Naylor et al., 2000). This practice poses several threats to the environment: Of course the natural stocks of the target specimen are depleted. This may also lead to problems for species that normally feed on them (e.g. shrimp larvae are a food source for many organisms). But there are also other side effects: bycatch may be very high in some cases and sometimes destructive gear like dredge nets is used (CBD, 2004). In general mariculture can (depending on cultivation method) take a lot of space, which can affect migratory routes and feeding patterns and reproduction of non-target species. One example is the destruction of mangroves to build shrimp ponds there. If these ponds are in operation later their effluents might pose a threat to adjacent mangrove ecosystems. Saltwater intrusion due to active pumping of groundwater into the ponds may lead to additional problems (Páez-Osuna, 2001, CBD, 2004). Like underwater exploders are sometimes used in mariculture to deter predators from the farmed animals. This can also stress non-target animals (CBD, 2004). This prevents escapes and aerated settling tanks or other (bio-)filters prevent most particulate nutrients and parts of the dissolved nutrients to enter the natural ecosystems. A disadvantage of them is that they require high initial investment (CBD, 2004). hardly extra effort is necessary to fulfil the requirements of organic aquaculture, a lucrative market. An example is to take into account water exchange rates and currents that dilute the waste (CBD, 2004). Whether dilution is a long-term-solution, is questionable. This could be realised by setting a threshold for stocking density or a careful selection of farmed species. Additionally the carrying capacity of the ecosystem to process waste products should be taken into account (CBD, 2004). Although it is difficult to assess, especially in coastal zones with cumulative pressure from several anthropogenic activities. Another new idea for intensive fish farming in cages that may help to prevent degradation of benthic habitats is this: fixing cages at only one mooring on a long line so that they can float over a large area (moved by e.g. wind and tidal currents) may help to reduce local amounts of sedimentation (Goudey et al., 2001). One example for this is the improvement of feed formulations (reducing N and P in the diets (N is assumed to be the limiting nutrient for phytoplankton growth in marine waters)). Another example is the use of efficient strains of the farmed species. It might also be helpful to raise the awareness of farm workers. In shrimp ponds natural feed items like zooplankton and benthic organisms could be used as a supplement to artificial diets (CBD, 2004). An expansion of farming of fish of low trophic levels and the reduction of fish meal and oils inputs in feed could be helpful (Naylor et al., 2000). Reducing fish meal in feed and improving feed efficiency are already priorities in the mariculture industry as feed is the largest cost point in many intensive culture systems and the prices of fish meal continue to rise (Naylor et al., 2000). This can be achieved by establishing lower stocking densities and leaving larger distances between individual farms. Probiotics can be used to improve the water quality. Vaccination is available against some important infectious diseases. Improved monitoring and quarantine stations might also show positive effects (CBD, 2004). Alternatives can be proper genetic selection programmes and the use of photoperiod management in the industrial production of salmon (CBD, 2004). This page was last modified on 21 February 2019, at 18:03.